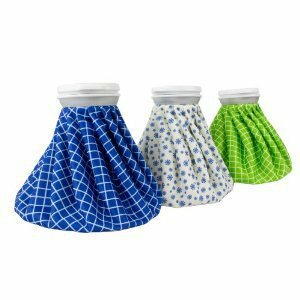 R&R Ice Hot Bag is an ideal bag for hot and cold therapy for pain relieve from sport injuries, aching muscles, menstrual period, headache and rheumatic fever. The bag is professionally engineered with wide, leak resistant cap design, which allows for easily filling of ice cubes. The bag does not leak and also does not get wet from condensation. A very soft fabric provides comfortable coverage of body area under care. This bag is reusable and economical. To use as an ice bag, just fill it with ice and close cap tightly before use. It lowers high body temperature and alleviates pain and soreness. To use as a hot bag, pour 50-60ºC (122-140ºF) hot water into bag, close cap tightly before use. To use as an ice bag, just fill it with ice and close cap tightly before use. It lowers high body temperature and alleviates pain and soreness. To use as a hot bag, pour 50-60ºC (122-140ºF) hot water into bag, close cap tightly before use. When used with hot water, it enhances blood circulation, relieves fatigue and reduces swelling. R&R Ice Hot Bag comes in 2 sizes and many bold colors and designs. It is a good bag to keep handy at home for pain relief and first aid. The Chattanooga Black Polyurethane Colpac brand is great for any type of aches or pains. These packs are latex free and filled with non-toxic silica gel that remains malleable throughout treatment. These packs are available in 4 different sizes for different body areas. The most versatile is the over-sized pack (12.5”x18.5”) which can cover a larger area or multiple affected areas resulting in faster treatment. Each Colpac product provides up to 30 minutes of ensured cold therapy and refreezes quickly for another instant application. These packs are designed for heavy clinical use and are soft and flexible enough to contour as per the body area or shape. The Chattanooga Black Polyurethane Colpac brand is great for any type of aches or pains. These packs are latex free and filled with non-toxic silica gel that remains malleable throughout treatment. These packs are available in 4 different sizes for different body areas. The most versatile is the over-sized pack (12.5”x18.5”) which can cover a larger area or multiple affected areas resulting in faster treatment. Each Colpac product provides up to 30 minutes of ensured cold therapy and refreezes quickly for another instant application. These packs are designed for heavy clinical use and are soft and flexible enough to contour as per the body area or shape. The smaller packs which target small areas are comparatively light to carry even when travelling. However, some users feel that the packs do not stay cold for a longer time, not more than 15-20 minutes. Some have seen leaking of gel as it splits at the seams if not properly sealed. 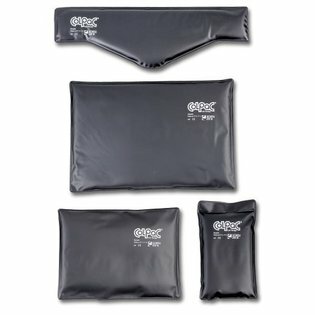 Overall, the Chattanooga Cold Pack – ColPac Brand- Black Polyurethane is perfect to get relief from acute pains, sprains, swelling, fever, post-surgery swells etc., for overall application or targeted areas like back, knee, shoulder, neck, hip or any other limb pains. It is highly recommended by most therapists for its efficiency, durability and affordable price. The Carex Bed Buddy Hot Cold Pack is good for treating neck, shoulder, arm, leg, knee, and back pains with soothing relief. It provides the moist heat relief which is recommended by physicians for fast and effective treatment of aches and pains. After heating in microwave for few seconds, it gives out moist heat providing an infusion of moisture to the top layer of skin to prevent moisture loss and improve hydration of skin and cells. This pack also helps arthritis patients in reducing the pain. It is also great for warming bed on cold nights. Carex Bed Buddy can also be used as cold pack but users do not find it very effective in that mode. It does not get very cold even after long time in freezer. Also some users complain about the bad odor when the package is opened. 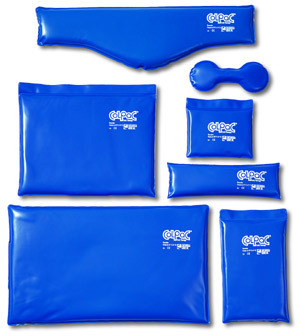 Overall, Carex Bed Buddy Hot Cold Pack is a great home therapy for relief from body pains. It contains 100% food grade oatmeal and rice in the fillings. It gets ready in minutes as heat pack and is reusable. The Chattanooga Blue Vinyl Colpac is an effective cold therapy to get relief from aches, pains, sprains, swelling, fever or post-surgery swells etc. These packs are latex free and filled with non-toxic silica gel that remain soft and flexible throughout, thus taking the shape of the targeted area for maximum effective treatment. The Blue Vinyl Colpac’s are available in seven different shapes and sizes catering to different small or large areas as per need. 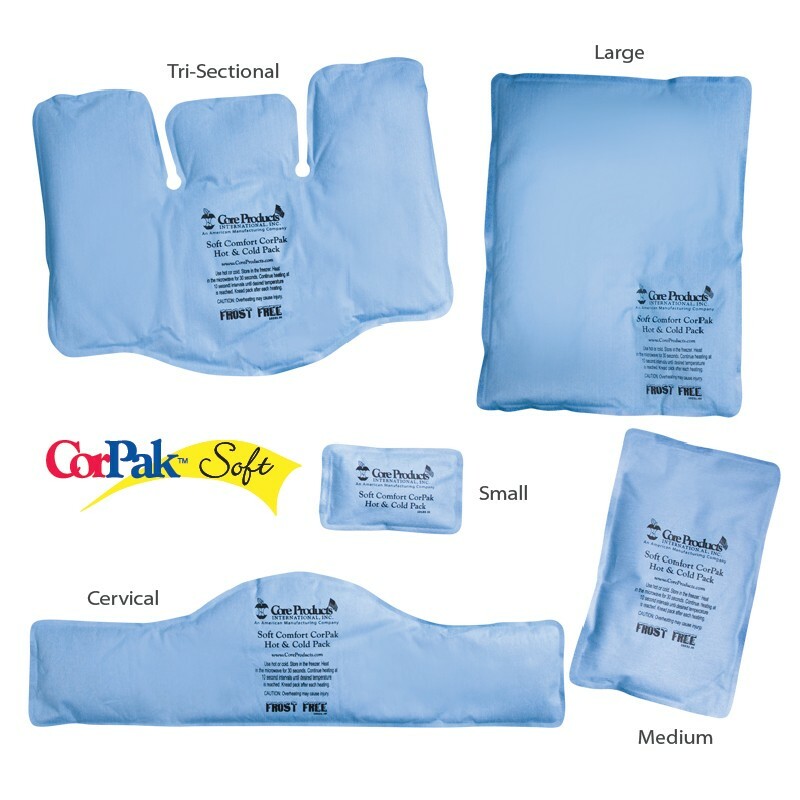 Needless to say the larger pack (11”x14”) is the most versatile among all as it covers maximum area or multiple areas in a single treatment. 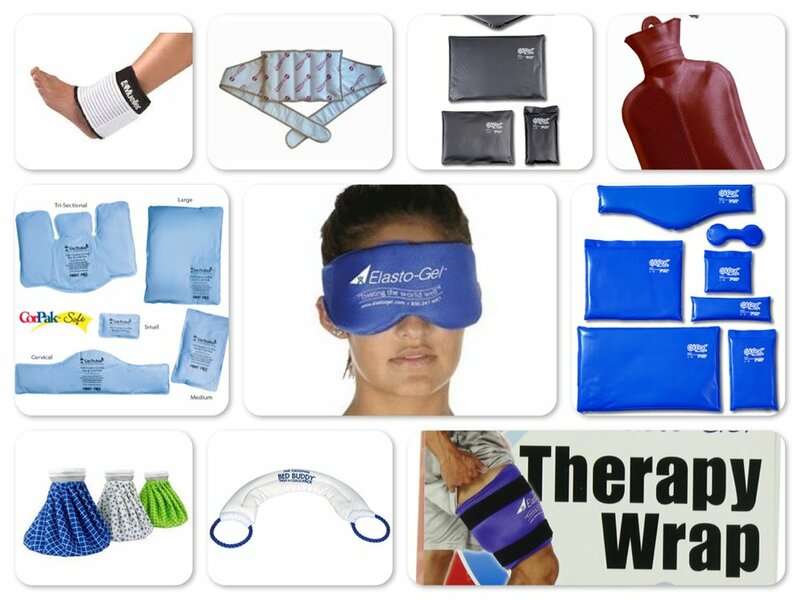 These packs are designed for clinical or home use and provide up to 30 minutes of ensured therapy. They refreeze quickly and are ready instantly for another application during acute trouble or emergencies. However, as it is recommended to be stored in freezer always, users feel the smell of other food or freezer items is absorbed by these packs. However, as it is recommended to be stored in freezer always, users feel the smell of other food or freezer items is absorbed by these packs. Also, the larger packs are space consuming and can be difficult to store continuously in smaller freezer. Overall, the Chattanooga Blue Vinyl Colpac is highly recommended cold therapy application for its efficiency, durability and affordable price. It helps areas like back, knee, shoulder, neck, hip, eyes or any other targeted body area with ease. 5. Thermalon Microwave Activated Moist Heat Therapy Wrap with Ties for Back, Hip, Shoulder, 7" x 12"
Thermalon Microwave Activated Moist Heat Therapy Wrap with Ties for Back, Hip, and Shoulder is specially designed to allow freedom of movement during treatment. This has versatile wrap ties, like a robe belt, for easy application of moist heat therapy. It can also be worn to relieve hip pain or abdominal cramps. You can freeze it for soothing cold therapy, if needed. This 7" x 12" pad with ties fits up to a 60" waist. It is perfect for Back Pain, Shoulder Pain, Aching Muscles, Arthritis, Tension and Stress. This wrap is easy to clean and is hand washable. Many users complain that this wrap does not get hot or cold enough to be effective. Many users complain that this wrap does not get hot or cold enough to be effective. Also it stays hot only for short period of time. Some users wish that it had Velcro instead of tie. Overall, Thermalon Microwave Activated Moist Heat Therapy Wrap is a good product to alleviate pain for a while. It can used be used under work clothes while working. For Moist Heat: Place product on a microwave safe plate in the microwave. Heat for 1-1/2 minutes. Do not exceed 2-1/2 minutes. To reheat a previously heated product, reduce the heating time by half. 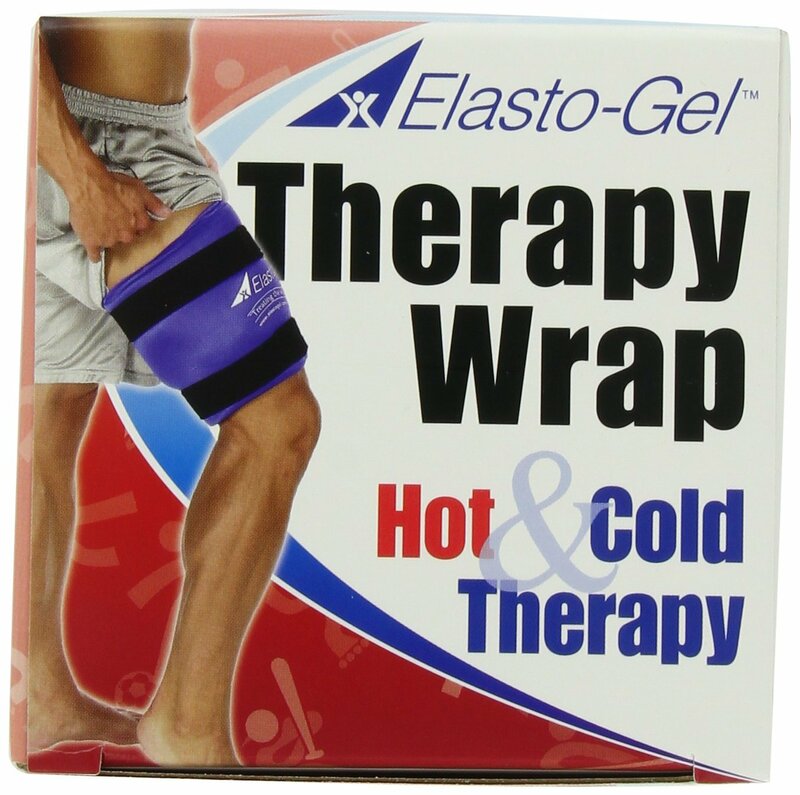 The Elasto-Gel All-Purpose Therapy Wrap is made of a tough, flexible high glycerin gel that is covered with a four way stretch material that allows maximum conformity, hot and cold transfer and comfort. This multi-purpose hot and cold wrap helps relieve muscle pain and speeds recovery after surgeries like knee replacements. They stay cold for about 20 minutes to provide soothing relief. These wraps are available in different sizes for use around different body parts. Elasto-Gel All-purpose wraps remain soft and pliable at temperatures as low as -20 degrees to as high as up to 250 degrees. The Elasto-gel wraps can be heated in a microwave and cooled in the freezer or refrigerator. These wraps have Velcro fasteners providing a strong hold to the place of application. Overall, The Elasto-Gel All-Purpose Therapy Wrap is a good product and is a must have after knee surgery. It is used and recommended by physical therapists. 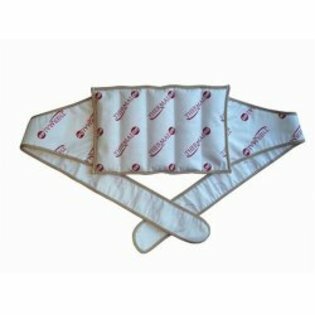 Mueller Cold/Hot Adjustable Wrap is an ideal pack and compression wrap for application of cold and heat therapy to all body joints. It has mesh pouch with hook and loop fasteners that holds reusable cold-hot packs. The adjustable elastic wrap conforms to injured area and keeps the pack in place. This versatile wrap is easy to use and stays in place around knee or ankle even while walking. It stays cold for long time providing soothing relief to joints and muscles. The wrap is durable and has good quality stitches. Some users say the ice pack is small and is not enough to treat both sides of the knee. You may need to buy 2 wraps to cover front and back of knee. 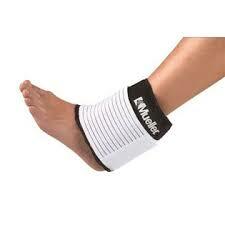 Overall, Mueller Cold/Hot Adjustable Wrap is a good product for treating sore knees, ankles and other body parts. Mabis Dmi Healthcare Rubber Water Bottle is a large 2 quart capacity bottle with ribbed surface that helps retain warm or cold temperatures. It is made from durable, natural rubber latex. 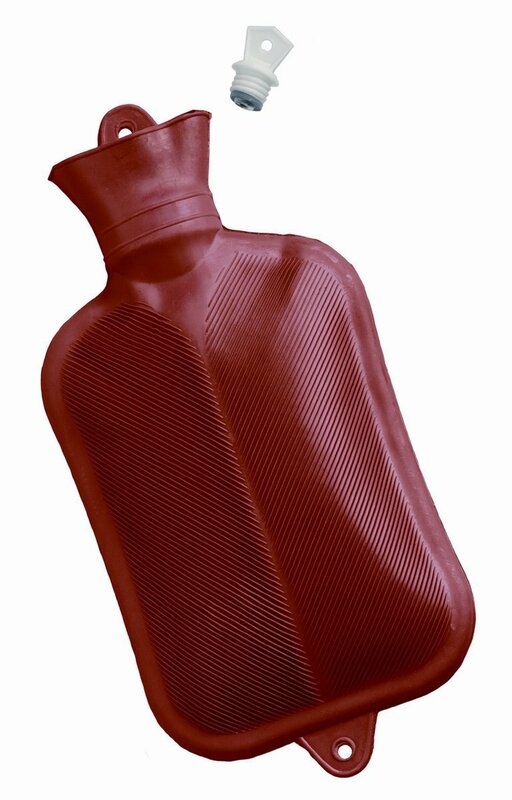 This simple to use bottle works well for body pain relief and as bed warmer. Just fill in hot water, close the cap tight and use it anywhere you like it. It does not leak and retains heat very well. Many users complain about the strong rubber smell this bottle emits when filled with hot water. The smell fades away after some time and also many users are not bothered by the smell at all and find it nostalgic. Overall, Mabis Dmi Healthcare Rubber Water Bottle is a classic, simple to use bottle for heat therapy. It is an inexpensive and good product. Elasto Gel Hot Cold Sinus Mask is perfect for those suffering from sinus pain. It fits most people and can also be used as a sleeping mask whether cool or warm, to block-out light. Users find this mask extremely comfortable and soothing. It has adjustable straps to keep it in place. If used for cold therapy, the mask can help with healing bruises or eye surgeries to reduce swelling and numb pain. The wrap will stay cold for 20-40 minutes, giving ample time for cold therapy. Heat therapy can aid in relieving sinus pressure, decreasing congestion and alleviating headaches by increasing circulation and relaxing muscles.